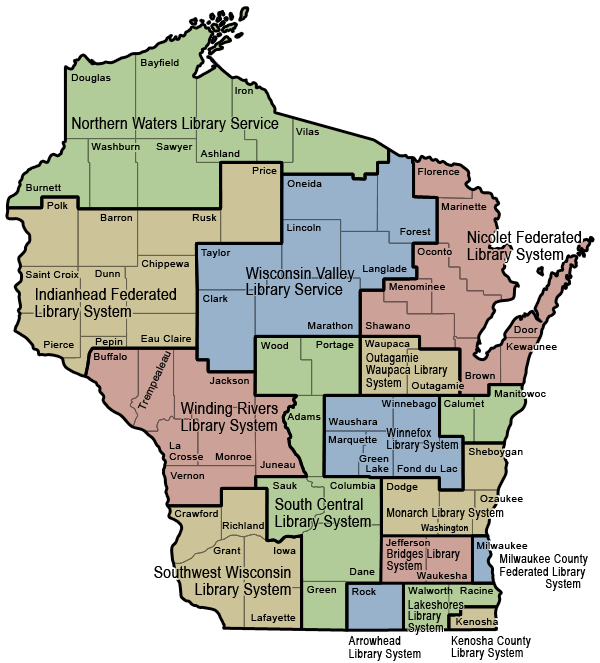 The Marathon County Public Library (MCPL) is a member of the Wisconsin Valley Library Service (WVLS), a library system made up of many other libraries throughout north-central Wisconsin (map). WVLS facilitates the online library catalog (V-Cat) shared by the public libraries in this system and provides libraries with logistical and financial support. Area served: 7,360 square miles, including the north central Wisconsin counties of Clark, Forest, Langlade, Lincoln, Marathon, Oneida and Taylor. Number of libraries: Service is provided through 25 public libraries and approximately 200 non-public libraries. Governance: WVLS operates under Chapter 43 of the Wisconsin Statutes and is governed by a 15-member Board of Trustees. Each participating county has at least one member on the board – the rest are allocated according to population. Trustees are appointed by the Chairs of the County Boards of Supervisors. Location: The WVLS rents space from and operates out of the Marathon County Public Library, 300 North First Street, Wausau, WI 54403. Budget & funding: Visit www.wvls.org for WVLS budget and funding information. Major services: Internet access; V-Cat, a shared automation system; courier service to/from all Wisconsin’s public libraries; reference services and facilitated resource sharing; consultant services and training for area library personnel and trustees; digital/online resources; and technical support. Staff: Visit www.wvls.org for WVLS staff information. WVLS is one of 17 library systems in Wisconsin. Systems range in size from one to 10 counties.